underwent a laser surgery (Refractive Surgery) for both of my eyes. I have been enjoying this new found freedom for almost 6 months now. Till date, once in a while I just look in the mirror and feel so good that the clear reflection I see of myself is devoid of any glasses or contact lenses. It would be quite difficult for people who have never worn powered glasses to comprehend the joy of getting rid of glasses. Only people who have gone through their lives feeling so dependent on glasses, feeling inadequate at even small moments in life such as rushing to find your glasses the moment you wake up, having a difficult time playing any sports for the fear of breaking your glasses, having a difficult time at the swimming pool would understand how great it feels to be free. Anyway, to come back to the objective of this post, ever since I went through the surgery, I have been receiving many calls from friends and acquaintances asking about the surgery. They usually want to know where I got the surgery, how much does it cost, if the quality in Nepal is good enough, how long does it take to recover and most of all: if the doctors will do some kind of check up before the actual surgery to ensure if it is suitable for their eyes. Based on my experience, I have already advised about a dozen people. Then I thought many other people might also want to know these things. So I have decided to present my readers this set of frequently asked questions about laser eye surgery in Nepal. I hope this helps. 1. 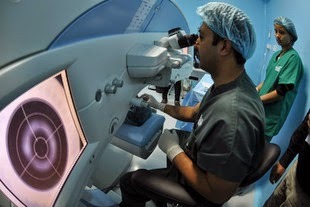 Is it possible to do laser eye surgery in Nepal? Of course. Tilganga Insitute of Opthalmology (TIO) has a ultra-modern Refractive Surgery Unit that can perform both LASIK and ReLEx SMILE surgeries and correct myopia (near-sightedness) and hypermetropia (far-sightedness). I don't think other hospitals in Nepal have such facility currently. 2. What are LASIK and ReLEx SMILE? Just the name of the two technologies used. 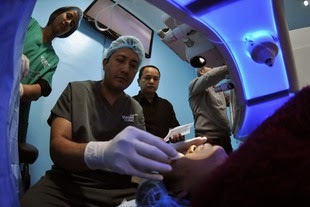 ReLEx SMILE is the latest one and better one but is more expensive than LASIK. At Tilganga both technologies are available and the surgeon decides which technology is more suited for you depending upon your eyes. They charge the same amount for both technologies. At the time of my surgery, it cost NRs. 75,000 for both eyes. The total cost including pre-surgery check up and medicines would come to around NRs. 80,000. The cost could have gone up slightly now. Still the cost is relatively very cheaper than similar surgeries in other hospitals of Nepal and hospitals abroad. I hear it the cost starts from Rs. 200,000 in India. TIO provides discounts for poor and needy people. 4. Who can go through this surgery? What age group? Up to how much power? The patient has to be above 18 years old. There is no upper limit regarding age. Powers of up to -14 and +6 can be corrected. But one has to go through a series of tests to see if he/she is eligible for the surgery. The doctors at Tilganga are quite fussy about the requirements. In my case, it seemed that they were checking my eyes over and over again. It was quite a tiring process but comforting to know that they were ensuring safety. I had to even go through a special retina check up before they said yes. 5.What is the procedure? What steps are involved? You have to call their office and book an appointment for pre-surgery check up. You can call either 977-1-4493775 or 977-1-4493684 to book an appointment but make sure that you mention that you are calling for RSVP or else they might mess up your appointment like they did mine. The check up consists of series of tests on your eyes that determine the dryness of your eyes, thickness of your cornea and the retina. The check lasts for about 4 hours. So be prepared to spend a whole day for the check up. It cost about NRs. 2500 last October. Only if you pass the pre-surgery tests, you can go through the surgery. If you pass the tests, then you can ask for a surgery date. The waiting time in not much long. In my case, it was two weeks. 6. How much time will the surgery take? The surgery takes about only 15 minutes for each eye. That means within half an hour you are done with the surgery of both of your eyes. Then you have to spend 10-15 minutes in another room with your eyes closed. You are visually incapacitated for the rest of the day though as you cannot open your eyes and you have to put in different kinds of drops every 15 minutes and every hour. For me, that was the most exhausting and irritating time. 7. Do they make you unconscious during the surgery? Or do they just anesthetize your eyes? Is it scary? They just anesthetize your eyes. A tool keeps your eyes wide open preventing your eyelids from shutting. You can see everything. You feel slight irritation while the laser operates in your eyes but it lasts for a very short period of time. Nothing to worry about. 8. How long will it take to get back my normal eyesight? Your sight is restored immediately after the surgery but it is quite blurry for the whole day. I had tried to watch TV to kill some time after the surgery but failed to do because the vision was too blurry. However, in the next 2-3 days I was able to return to my normal routine except riding my motorbike. You have to keep putting drops of medicines every half hour through the week though. That was a minor inconvenience. But you are not allowed to wash your face properly for a week, a major inconvenience. 9. What are the risk/potential side effects of the surgery? They say the risks associated with laser surgeries are almost non-existent. But they do exist. There are two major side-effects though. Dryness and Increased glare. For the next 3 months after the surgery, my eyes would get dry once in a while and I had to put a few teardrops. Teardrops do become your best friend after the surgery. Five months down the line, I still have to use teardrops but rarely. Maybe once in a week. Sometimes once a fortnight. My eyes need teardrops when I use computers for extended period of time. But at other times, my eyes are perfectly fine. Another side effect I witnessed is the increased glare while staring at light sources. This is a minor inconvenience while driving. The glare was large in the early days but returned to normal in about two months after the surgery.